it’s aural, not oral, photography! i was explaining to maximillian my photography adventure with facebook friends carolyn quinn and azusa watanabe. it’s not oral it’s aural–a form of photography that is meant to capture the inner essence of a person. laconda verde is a restaurant in manhattan owned by robert de niro. my facebook friend michele persiak has agoraphobia but so wanted to go to this restaurant that she managed to get out of her house, take the staten island ferry and come to the restaurant with us. at his morning staff meeting, mr. de niro no doubt was determined that his waiters and waitresses deliver the highest standards of new york service. 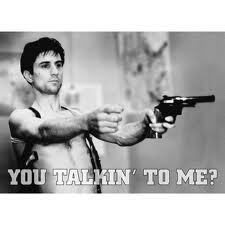 mr. de niro starred in the 1976 movie taxi driver as an angry, depressed, homocidal young new york man. but a taxi driver, not a waiter. after lunch, michele went home and i hope she is aware that if you can have lunch at laconda verde, you can make it anywhere! but i wanted to spend a little more time with carolyn and azusa. i was particularly intrigued by azusa. we became friends in february of last february. a japanese social media site mixi.jp did a story about my facebook new year’s resolution. when azusa was traveling in the united states this summer she made a point of contacting me and figuring out when we would be in the same city. i really appreciate that! azusa is a teacher of conversation english in tokyo. 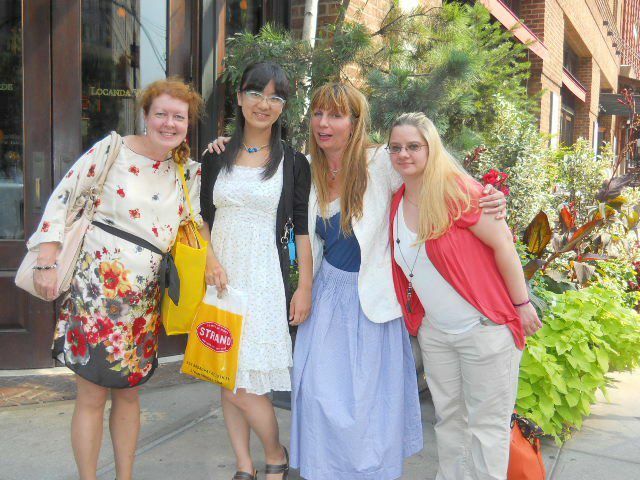 the new york lunch bunch–carolyn, azusa, me, and michele. none of us would be friends without the help of facebook. so thank you mark zuckerberg! carolyn suggested that we go to china town and get our aural photographs taken. she has done so before and it turns out she is what is termed an “indigo girl”. . . which means that she has a great degree of creativity and spirituality. we went to a small little shop that sold crystals, jewelry, herbal supplements. each of us sat for our picture. the photographer was a little strict. as it turns out carolyn again was revealed to be an indigo girl! 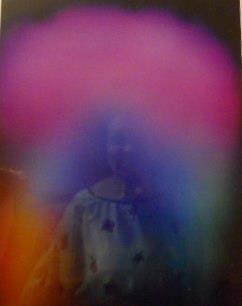 which meant that her picture was a fuzzy melange of purple-ish tones. carolyn is hard to see with all that life field around her! azusa and i turned out to be sort of yellow and red, meaning we had a great deal of creativity and verve. oddly, all three of us were advised by the photographer that our chakra showed that we needed some sleep. well, azusa was jetlagged, carolyn has bronchitis and me? i hadn’t slept the night before because i was starting to worry about how i was getting home. and i had a right to be worried! This entry was posted on Tuesday, August 14th, 2012 at 3:29 pm	and tagged with aural photography, chakras, facebook, friends, friendship, japan, laconda verde, life fields, manhattan, meeting friends, new friends, new york standards of restaurant service, robert de niro, taxi driver and posted in Uncategorized. You can follow any responses to this entry through the RSS 2.0 feed. « in order to succeed. . . I remember when aura’s were so popular. Not sure about the colors some talk about, but I do know that we all have our own “vibes.” Cool post!